Ben Harding scored the decisive penalty as Wycombe overcame Colchester in a Carling Cup thriller. The hosts had gone into a two-goal lead following Scott Donnelly's 18-yard strike and a tap-in from Joel Grant. The U's hit back with Kayode Odejayi's finish from Michael Rose's cross, and an Ian Henderson rocket from 25 yards. A Steven Gillespie penalty in extra time for Colchester and a long-range equaliser from Stuart Beavon set the stage for Harding's decisive kick. "I feel for my team, I think they've done everything possible to win the game. "From being two goals down, we've handled it well, I've been delighted with the response of the team. "For 30 minutes going up to half-time, I thought our football was absolutely excellent." "The players are very pleased with progressing in to the next round, but they're also very pleased with their performance. "Early on we lost our way in the first half when Colchester pegged us back but we got ourselves back in to the game in the second-half. "We improved in that spell against a very good team, and you can tell [Colchester boss] John Ward has put a group of players together who are going to do very well this season." 124:40 Ben Harding scores a penalty. 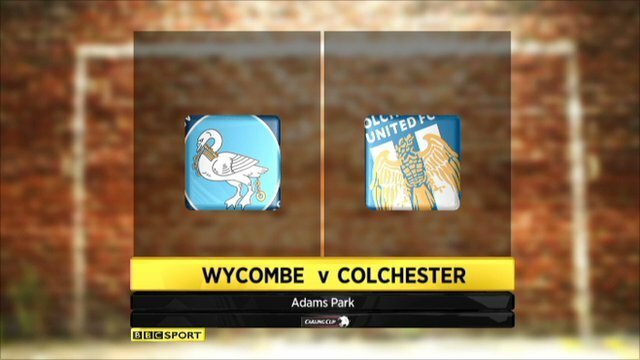 Wycombe 5-4 Colchester on penalties. 124:00 Penalty taken by Michael Rose is saved by Nikki Bull. 123:25 Penalty scored by Scott Rendell. Wycombe 4-4 Colchester on penalties. 123:02 Penalty scored by Lloyd James. Wycombe 3-4 Colchester on penalties. 122:28 Stuart Beavon scores a penalty. Wycombe 3-3 Colchester on penalties. 122:06 Ian Henderson scores a penalty. Wycombe 2-3 Colchester on penalties. 121:34 Marvin McCoy scores a penalty. Wycombe 2-2 Colchester on penalties. 121:14 Penalty scored by Anthony Wordsworth. Wycombe 1-2 Colchester on penalties. 120:38 Penalty scored by Andy Sandell. Wycombe 1-1 Colchester on penalties. 120:02 Penalty scored by Steven Gillespie. Wycombe 0-1 Colchester on penalties. 120:01 The first player steps forward to start the penalty shoot-out. 120:00+1:07 The match is going to penalties. 119:26 Substitution Ben Coker joins the action as a substitute, replacing Kayode Odejayi. 118:11 The ball is swung over by Joel Grant, Matt Heath manages to make a clearance. 117:39 Joel Grant produces a right-footed shot from just outside the penalty box that misses to the left of the target. 114:17 Dave Winfield challenges Kayode Odejayi unfairly and gives away a free kick. Michael Rose restarts play with the free kick. 113:54 Jordan Ibe delivers the ball. 111:55 Substitution Leon Johnson leaves the field to be replaced by Dave Winfield. 111:36 The ball is delivered by Brian Wilson, Ian Henderson takes a shot from just outside the penalty area clears the crossbar. 110:24 The ball is sent over by Ben Harding, save by Mark Cousins. 109:51 Lloyd James challenges Joel Grant unfairly and gives away a free kick. Direct free kick taken by Andy Sandell. 109:06 Marvin McCoy delivers the ball. 107:21 Anthony Wordsworth sends in a cross, clearance made by Scott Rendell. 106:56 Inswinging corner taken from the right by-line by Anthony Wordsworth. 106:34 Corner taken by Anthony Wordsworth from the left by-line, Scott Rendell makes a clearance. 106:22 Ian Henderson takes a shot. Save by Nikki Bull. 105:01 Second half of extra-time has started. 105:00+0:52 Stuart Beavon challenges Michael Rose unfairly and gives away a free kick. Michael Rose takes the free kick. 104:38 GOAL - Stuart Beavon:Wycombe 3 - 3 Colchester Stuart Beavon gets on the score sheet with a goal from outside the box to the top right corner of the goal. Wycombe 3-3 Colchester. 104:09 The referee blows for offside against Kayode Odejayi. Indirect free kick taken by Leon Johnson. 103:23 Substitution Scott Donnelly goes off and Jordan Ibe comes on. 101:10 Andy Sandell produces a cross, Magnus Okuonghae manages to make a clearance. 99:50 Effort from inside the area by Lloyd James misses to the right of the goal. 98:29 Foul by Kayode Odejayi on James Tunnicliffe, free kick awarded. James Tunnicliffe takes the direct free kick. 97:48 GOAL - Steven Gillespie:Wycombe 2 - 3 Colchester Placed penalty scored by Steven Gillespie. Wycombe 2-3 Colchester. 96:52 Andy Sandell concedes a Penalty for a foul on Anthony Wordsworth. 96:14 Inswinging corner taken by Lloyd James from the left by-line played to the near post, clearance made by Andy Sandell. 95:54 Corner taken by Anthony Wordsworth from the right by-line. 95:34 Steven Gillespie takes a shot. Save made by Nikki Bull. 93:28 Andy Sandell has an effort at goal from outside the penalty area which goes wide right of the goal. 91:01 Effort from the edge of the box by Joel Grant goes wide of the left-hand post. 90:25 Steven Gillespie takes a shot. Nikki Bull makes a save. 90:00+3:51 The match has reached the end of normal time. 90:00+3:08 Ian Henderson takes a shot. Save by Nikki Bull. 90:00+2:17 Foul by Anthony Wordsworth on Joel Grant, free kick awarded. Free kick taken by Andy Sandell. 90:00+1:01 Booking Booking for Steven Gillespie for unsporting behaviour. 90:00+0:57 Booking Stuart Beavon receives a caution. 90:00+0:03 Steven Gillespie fouled by Stuart Beavon, the ref awards a free kick. Direct free kick taken by Kemal Izzet. 86:50 Effort from the edge of the area by Kayode Odejayi goes wide of the right-hand post. 85:38 Foul by Steven Gillespie on Marvin McCoy, free kick awarded. The free kick is swung in right-footed by Andy Sandell, Mark Cousins makes a save. 84:37 The ball is crossed by Anthony Wordsworth, Scott Donnelly makes a clearance. 83:39 Free kick awarded for a foul by Stuart Beavon on Lloyd James. Michael Rose restarts play with the free kick. 80:04 Foul by Brian Wilson on Joel Grant, free kick awarded. Scott Donnelly restarts play with the free kick. 79:08 Substitution Scott Rendell comes on in place of Kadeem Harris. 78:58 A cross is delivered by Marvin McCoy. 74:50 The ball is crossed by Ian Henderson, Close range effort by Anthony Wordsworth goes wide of the right-hand upright. 74:22 Substitution Lloyd James comes on in place of John-Joe O'Toole. 73:47 Andy Sandell concedes a free kick for a foul on Kemal Izzet. Direct free kick taken by Mark Cousins. 73:35 Marvin McCoy produces a cross, John-Joe O'Toole makes a clearance. 72:09 Ian Henderson gives away a free kick for an unfair challenge on Joel Grant. Direct free kick taken by Scott Donnelly. 71:49 The ball is crossed by Anthony Wordsworth. 71:23 Anthony Wordsworth takes the inswinging corner, Ben Harding makes a clearance. 67:23 Scott Donnelly takes the inswinging corner, free kick awarded for an unfair challenge on Matt Heath by James Tunnicliffe. Mark Cousins restarts play with the free kick. 67:23 Substitution Steven Gillespie replaces Ashley Vincent. 66:46 Kadeem Harris has a shot on goal from outside the area which misses left. 66:27 Unfair challenge on Joel Grant by Ian Henderson results in a free kick. Direct free kick taken by Scott Donnelly. 65:40 Foul by Leon Johnson on Kayode Odejayi, free kick awarded. Direct free kick taken by Anthony Wordsworth. 65:03 The offside flag is raised against Stuart Beavon. Mark Cousins takes the free kick. 64:08 Matt Heath challenges John Halls unfairly and gives away a free kick. James Tunnicliffe restarts play with the free kick. 63:28 Centre by Ian Henderson, Nikki Bull makes a save. 63:13 Free kick awarded for an unfair challenge on Matt Heath by Stuart Beavon. Matt Heath restarts play with the free kick. 63:00 Ian Henderson sends in a cross, clearance made by Marvin McCoy. 59:27 The ball is sent over by Kadeem Harris, clearance by Michael Rose. 58:20 Centre by Joel Grant. 58:04 Free kick awarded for a foul by Ian Henderson on Andy Sandell. Direct free kick taken by Andy Sandell. 56:52 Unfair challenge on Ian Henderson by Kadeem Harris results in a free kick. Brian Wilson restarts play with the free kick. 53:27 The ball is delivered by Marvin McCoy, save by Mark Cousins. 53:00 The ball is crossed by Brian Wilson, save made by Nikki Bull. 52:47 Brian Wilson sends in a cross. 51:56 Free kick awarded for an unfair challenge on Kayode Odejayi by James Tunnicliffe. Direct free kick taken by Michael Rose. 51:32 A cross is delivered by Kadeem Harris. 51:01 A cross is delivered by Michael Rose, save by Nikki Bull. 49:27 Anthony Wordsworth challenges Ben Harding unfairly and gives away a free kick. James Tunnicliffe restarts play with the free kick. 45:51 The ball is sent over by John-Joe O'Toole. 45:17 Kayode Odejayi sends in a cross, Marvin McCoy makes a clearance. 45:00+3:03 The whistle is blown to end the first half. 45:00+1:44 Outswinging corner taken from the right by-line by Scott Donnelly, Unfair challenge on John-Joe O'Toole by Andy Sandell results in a free kick. Direct free kick taken by Mark Cousins. 45:00+0:57 Ashley Vincent delivers the ball, Ben Harding manages to make a clearance. 44:45 The ball is swung over by Kayode Odejayi, clearance made by Ben Harding. 43:25 Foul by Brian Wilson on Andy Sandell, free kick awarded. Free kick crossed right-footed by Scott Donnelly, Brian Wilson makes a clearance. 42:59 A cross is delivered by Anthony Wordsworth, save by Nikki Bull. 41:52 Centre by Ian Henderson, Anthony Wordsworth produces a right-footed shot from inside the area that clears the bar. 40:15 Assist by Kemal Izzet. 40:15 GOAL - Ian Henderson:Wycombe 2 - 2 Colchester Ian Henderson grabs a goal from outside the area to the top left corner of the goal. Wycombe 2-2 Colchester. 39:41 Michael Rose sends in a cross, Nikki Bull makes a save. 38:15 The ball is crossed by John-Joe O'Toole, Header from deep inside the penalty area by Ashley Vincent goes harmlessly over the crossbar. 36:07 Matt Heath has an effort at goal from long range that misses to the right of the goal. 34:59 Ashley Vincent has shot on goal from just outside the penalty box which goes wide of the right-hand upright. 33:57 Kayode Odejayi takes a shot. Nikki Bull makes a save. 32:54 Ian Henderson delivers the ball, clearance made by Leon Johnson. 31:12 Anthony Wordsworth takes the inswinging corner, Headed effort from inside the area by Matt Heath misses to the left of the target. 30:55 Anthony Wordsworth takes a shot. Nikki Bull makes a save. 29:50 Free kick awarded for an unfair challenge on Kayode Odejayi by James Tunnicliffe. Michael Rose restarts play with the free kick. 28:42 Ian Henderson sends in a cross. 28:08 Ashley Vincent is ruled offside. James Tunnicliffe restarts play with the free kick. 27:00 The assistant referee signals for offside against Stuart Beavon. Kemal Izzet takes the free kick. 26:13 Assist on the goal came from Michael Rose. 26:13 GOAL - Kayode Odejayi:Wycombe 2 - 1 Colchester Kayode Odejayi finds the net with a headed goal from close range. Wycombe 2-1 Colchester. 25:50 Centre by Anthony Wordsworth, clearance made by Marvin McCoy. 23:11 Outswinging corner taken left-footed by Anthony Wordsworth from the left by-line to the near post, Headed effort from deep inside the area by John-Joe O'Toole misses to the right of the goal. 22:15 Joel Grant takes a shot. Save by Mark Cousins. 20:18 Scott Donnelly takes a shot. Mark Cousins makes a save. 19:43 Free kick awarded for an unfair challenge on John Halls by Anthony Wordsworth. Direct free kick taken by Scott Donnelly. 18:42 The ball is crossed by Kadeem Harris, clearance made by Anthony Wordsworth. 17:39 The ball is swung over by Brian Wilson, Effort from the edge of the box by Ashley Vincent goes wide of the right-hand upright. 13:52 Joel Grant fouled by Anthony Wordsworth, the ref awards a free kick. Shot comes in from Scott Donnelly from the free kick. 13:08 The offside flag is raised against Ashley Vincent. Nikki Bull takes the direct free kick. 11:31 GOAL - Joel Grant:Wycombe 2 - 0 Colchester Joel Grant gets on the score sheet with a goal from close in to the bottom left corner of the goal. Wycombe 2-0 Colchester. 11:13 Stuart Beavon takes a shot. Mark Cousins makes a save. 9:22 The offside flag is raised against Ashley Vincent. Marvin McCoy restarts play with the free kick. 4:49 A cross is delivered by Ashley Vincent. 3:57 The ball is sent over by Anthony Wordsworth, Headed effort from deep inside the penalty area by Ashley Vincent misses to the left of the goal. 3:24 Centre by Brian Wilson, Ben Harding makes a clearance. 1:40 Andy Sandell provided the assist for the goal. 1:40 GOAL - Scott Donnelly:Wycombe 1 - 0 Colchester Goal scored by Scott Donnelly from the edge of the penalty box to the top right corner of the goal. Wycombe 1-0 Colchester.